Hencote winery is a new 1,700sqm working wine production facility in Shropshire. 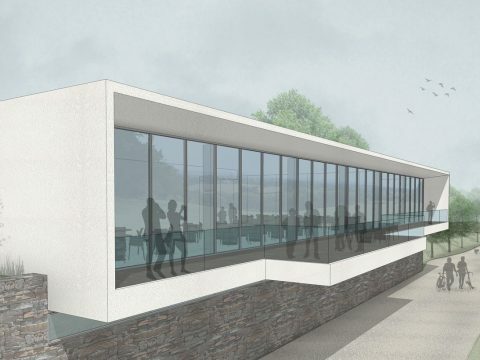 It will include a visitor centre, restaurant and events space arranged around a central sheltered courtyard with large plate glass windows to give 180 degree views across the vineyards towards Shrewsbury and the hills beyond. The winery and visitor centre sits on a natural plateau on the edge of a steep south facing slope above the Shropshire plains. In order to maximise the views from the visitor centre, while trying to achieve a clear floor to ceiling glazed facade, a deep cantilevered roof provides shelter to the south facing balcony. The low and linear building will be of a contemporary and simple style but in keeping with the surrounding context of the site. Nestled between mature sycamore trees the building will assimilate with the existing ridge line. The production facility is enclosed in cladding with recessed strip windows to allow glimpses to the interior space and to view the wine making process. The winery will produce wine from the seven grape varieties planted on the south facing slopes of the 60 acre estate.